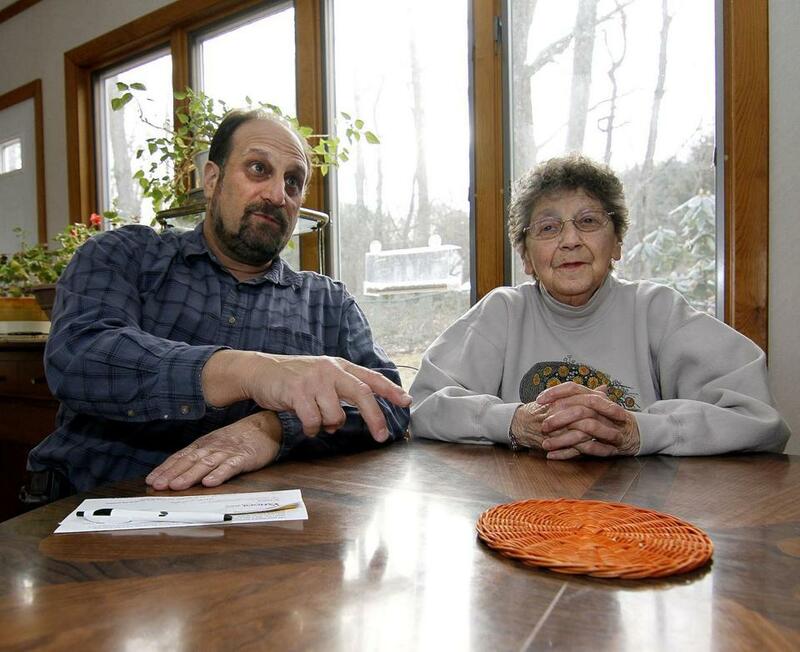 Craig Edwards and his mother, Doris, are concerned about the impact of large houses being built in their Sharon neighborhood. SHARON - Houses were smaller in 1954, when the Edwards family bought a newly built home on Edge Hill Road in Sharon. Their house sits in a row of ranches across the street from a row of Cape Cods, all of them modest in size. But over the decades, new homes steadily got bigger - generally, even with a slight dip because of the recession, they are about 50 percent larger than those built in the early 1970s - so when they pop up, older neighborhoods like Edge Hill Road can seem incongruous to longtime residents. Although any architectural style can be part of the large-house phenomenon, the typical structure that draws concern has a high roof line and sits closer to the property line than the one it replaced. Whether the problem is purely aesthetic or a more practical one of blocked views and bright outdoor lighting, some people dislike a house that dwarfs the rest of the neighborhood. Call it McMansion backlash. A few Boston-area communities, including Cohasset and Wellesley, have imposed special regulations on new houses over a certain size, and now the town of Sharon is considering doing the same. “Personally, I don’t really like the idea of government getting involved, but I don’t like the idea of houses that are too large on lots that are too small,’’ said Craig Edwards, 57, who grew up on Edge Hill Road and moved back home three years ago. How two towns discourage large houses. His mother, Doris, worries that big houses on the street will drive up property values and tax her out of Sharon. That’s why the younger Edwards tentatively supports large-house review, a policy the Sharon Planning Board discussed at a recent meeting. The board has not started to draft a policy yet, but expects to consider one later this year for presentation to Town Meeting, according to chairwoman Susan Price. In general, large-house bylaws require new construction over a certain size to undergo an extra review. Neighbors receive notification and get a chance to ask for changes to the plans. In Wellesley, planner Ethan Parsons said the town determined as part of the research for its 2006 comprehensive plan that property owners were often demolishing older houses and building much larger ones in their place. “The character of neighborhoods was changing because of construction activity,’’ he said. Nationally, the median size of a new house rose by more than 750 square feet from 1973 through 2007, according to the US Census Bureau. Even in 2010, after the collapse of the housing market, new homes remained almost 650 square feet larger than in the 1970s, with the median structure at 2,169 square feet. Using the median, or midpoint, reduces the potential for very large or small houses to affect the calculation of typical house sizes. The median square footage was only slightly lower than the average square footage - in 1973, the average size of a new single-family house was 1,660 square feet; in 2010, it was 2,392 square feet, an expansion of 732 square feet. New houses are even larger in some Massachusetts communities, particularly near Boston. According to Mass Audubon’s 2009 report, “Losing Ground: Beyond the Footprint,’’ from 1999 to 2005, new houses in Westwood averaged 4,003 square feet; in Milton, the number was 4,079, and in Cohasset, 4,135. Wellesley was even higher, at 4,614. Sharon had a lower average square footage, at 3,425, putting it more in line with Duxbury, Hingham, and Scituate. Parsons said a new suburban house that replaces a tear-down tends to be substantially larger, which means it may be closer to the property line, have more outdoor lighting, and affect drainage on surrounding properties. Neighbors cannot block construction if a house meets height and setback requirements. William C. Wheaton, a professor in the Department of Economics and the Center for Real Estate at the Massachusetts Institute of Technology, said that because state law does not give cities and towns the authority to regulate the size of houses, communities that impose restrictions on large homes run the risk that a disgruntled developer will seek judicial review. “It’s kind of an interesting stretch of the law,’’ he said. In Sharon, Price said Edge Hill Road resident Laura Nelson, a member of the Finance Committee, first raised the issue about a year ago. According to neighbors, a house within sight of Nelson’s was razed, and a larger home built in its place. Assessors’ records show the house was built in 2006 and sold in October. It has 3,928 square feet of living space on 1.38 acres; an attached garage makes the house appear larger. Most of the houses on Edge Hill, particularly ranches like the one where the Edwards family lives, run about 1,200 to 1,500 square feet. The owner of the house declined to comment. Nelson also would not comment on that particular house or the proposed new policy, other than to say she hopes the Planning Board addresses large-house review this year. Under Wellesley’s bylaw, which took effect in 2008, abutters receive notification of plans for any home that meets a size threshold linked to the size of the lot. The size includes living space and any garage. On a 30,000-square-foot lot, for example, 7,200 square feet triggers a review. If the lot is 10,000 square feet, a house of 3,600 square feet triggers a review. Although a public hearing is not required, the Planning Board accepts written comments and may, if it chooses, hear oral testimony when the board discusses the matter at a public meeting. Wellesley also has a Design Review Board that makes recommendations to the Planning Board, which determines whether the house meets standards of scale and other criteria - circulation of traffic, drainage, landscape preservation, lighting, and open space. Less than 25 percent of builders have had to change the size of a building, and not significantly, Parsons said. Size is not always the most salient issue. When the town seeks changes, the changes usually focus first on landscaping, an easier and less expensive fix, he said. “Once a project is proposed, the house really becomes one feature of the entire site development,’’ he said. Cohasset’s bylaw has been in effect since 2004, with a size threshold of the greater of two measurements: 3,500 square feet or 10 percent of the lot up to 6,000 square feet. Abutters receive notification and the Planning Board holds a hearing, but unlike in some communities, the board cannot set conditions on the project; instead, it makes recommendations to the building commissioner, who takes them into consideration when deciding whether to issue a building permit. Jo-Ann Pilczak, planning administrator in Cohasset, said the town has conducted 33 large-house reviews since the bylaw’s inception, and in the vast majority of cases, the Planning Board recommends homes be approved. “The purpose of our large-home review is to give neighbors notice of what’s happening,’’ she said, and the system has worked well. Building Commissioner Bob Egan said the tear-down-and-rebuild phenomenon is nothing new in Cohasset, where residents like their water views. At first, Egan had his doubts about adding a layer of bureaucracy for large homes, because he considered it “a little bit of an abridgement of people’s rights,’’ he said. But now, he loves the bylaw’s ability to get things out in the open with neighbors in advance of construction. “They can’t say they didn’t know,’’ he said. Sharon resident Louise O’Brien, who owns a small Cape on Edge Hill Road, said that if a large-house bylaw discourages more demolition of small homes, she would be pleased, because Sharon needs places for older people to live without paying high taxes. Lifelong Sharon resident Shirley Schofield, a member of the Historical Commission and Sharon Historical Society, supports the idea. But on Edge Hill Road, not everyone agrees. Betty LeBlanc, who added a second story to her ranch, said she had difficulty getting permission from the town. Had the project been subject to extra review, “that would’ve made my life totally miserable,’’ she said. Raja Mathur, who lives nearby, in a tile-roofed 1930s house of about 3,900 square feet, said a large house should not suffer extra scrutiny as long as it meets the town’s other requirements. The replacement of old houses with new ones shows real estate values are strong, said Wheaton, the MIT professor. It also brings new tax revenue. “Any time you see this going on, you’ve got good land,’’ he said. In some states, Wheaton said, towns try to do the opposite of large-house review - setting a minimum size or investment for new homes to keep property values up. As for how the policy might work in Massachusetts, giving neighbors more opportunity to influence development has its good and bad points, he said. Comments can improve a project and lead to more sensitive development, but some neighbors seek to block any and all construction. “It’s a very delicate balance,’’ he said.